Since last month, I noticed that ViralFB script was removed from CodeCanyon. I am not sure it is removed by CodeCanyon or ViralFB team removed it by themselves. 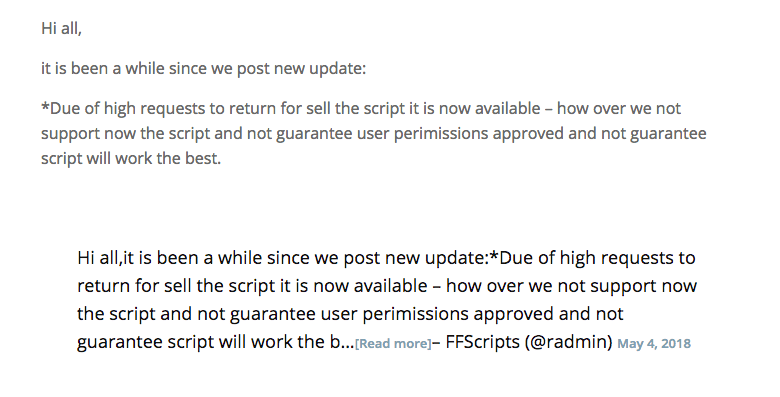 And also they deleted their Facebook page and also removed sale post from their website: But in this month, they repost the script to the sale on their website again. They also post the following announcement. My website using FFscript is not running properly at the moment. It couldn’t generate result if the quiz use the user profile image. 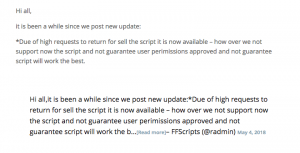 It is known error and FFscript team also mentioned about it. But there is one big issue I am facing at the moment. This is capacity problem. I am not sure how the script is developed. But when you get many users at single time (around 500 users), site is down. Initially I thought that it was server problem, so that I migrated my site to Digital Ocean with high resources setting to accommodate many users. But it is still happening. And finally I faced regular website down problem at around 30 minutes interval. Even with few user (around 50 users) it is still happening. So I would like to suggest that if you are going to purchase ViralFb, please check with the seller first. Please try to reach out to them to make sure how can you get support if you face a problem. Actually ViralFB is the script that can generate highest CPM among viral scripts. But because of the problems I mentioned above, now I move to phpviralquiz scripts. I need to develop a website where people can make their own quizzes and then assign the quizzes to others i.e. students/audience. Please tell me where can I find the best solution for this, what would I need and most importantly how much would it cost. Sorry for late reply. I have been away from this blog. Have you found the one you need? I really don’t know about quizzes platform where people can make their own quizzes. Some wordpress plug in may have this feature. Or do you want me to check with my developer team for the cost?